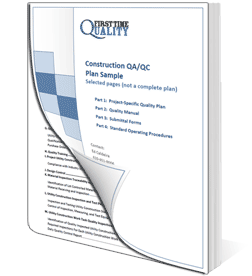 Basic Construction QA/QC Plans for general and specialty contractors — cover all the essential elements of a well-formed QA/QC Plan without a lot of added detail. All Basic "Essentials" Quality Plans costs $295, but NOT all essentials plans are the same. Your plan will be based on your requirements. So, if your specification require more, we'll add additional forms and sections. Your Essentials Quality Plan will be personalized with your company logo, company name and project name make a very nice, professional presentation. This plan is fully-written, about 30 pages long; It includes an executive QA/QC plan overview, a project-specific quality plan, and submittal forms. Or, contact us at 410-451-8006 and we'll answer all of your questions. See why hundreds of companies, both large and small, trust us for the QA/QC and safety solutions.